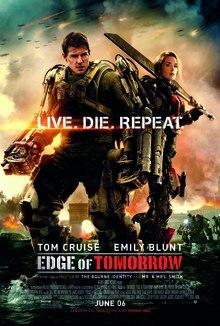 I just saw one: Edge of Tomorrow. It’s as fun a summer blockbuster as you’ll find. The premise unites the ideas behind Groundhog Day and Aliens in a way that feels more original than it has a right to. The acting is strong. There are plenty of funny scenes, moving scenes, quotable lines. I could watch it again. Seriously, it’s a blast. Check it out. Yet, I have to say, the title stinks. The story the movie is based on is called “All You Need Is Kill”, which is clunky in English though I’m sure sounds insanely cool in the original Japanese. But even that translated title is superior to Edge of Tomorrow. Sure, the title sounds vaguely science fictionesque and does arguably touch on part of the movie’s premise, but it’s only about one half step removed from calling the flick Generic Science Fiction Film #37. Honestly, if you’re going to spend $200 million on a movie, shouldn’t you lock some of the punch up guys in the room until they come up with an absolute stunner of a title? The extra millions at the box office would more than pay for their Chinese food, pizza, and wifi. So I settled on Dismantle the Sun (Thank you, W.H. Auden). It felt like it described the feel of the book, things breaking down for a couple that loved science in general and astronomy in particular. It hasn’t made me rich or famous yet, but I like it. I think it’s right. So what do you think, reading several? Can you think of any great stories stuck with terrible titles? If so, lay them on me in the comments. I’ll post of list of the best ones in a week or so.